Ladbroke Grove, West London, Chesterton Road Post Office 1909. It was a stroke of luck to be able to find the location of this postcard. The original was very faded and there is no postmark on the back to aid with identification. There is a message on the back dated July 7th 1909. The person I bought the postcard from said it came from a collection of cards from around the Notting Hill area. After a little editing I was able to read the '.....erton Road' sign at the top which enabled me to pinpoint the Chesterton Road location. Amazingly the shop is still there, though it has lost much of its charm. Click the postcard to enlarge. 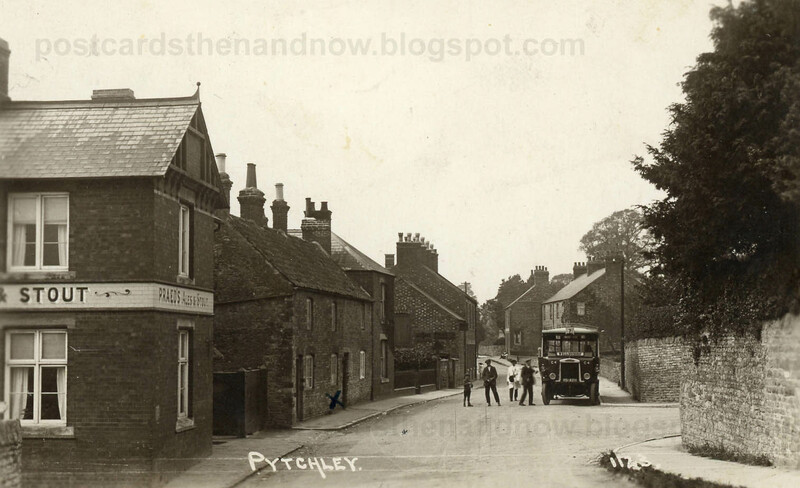 Pytchley, Northamptonshire circa 1920. Pytchley is a village in Northamptonshire, south of Kettering. The bus is a number 7 to Wellingborough. It has solid rubber tyres. Postcard by an uncredited publisher, click to enlarge. 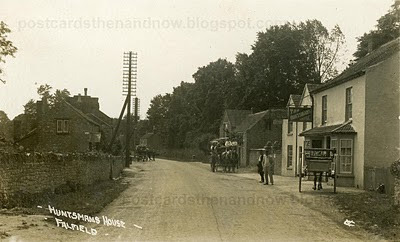 Falfield, Gloucestershire, The Huntsmans House Pub, c 1910. The pub is now called The Huntsman Inn and the surrounding area is not nearly as idyllic. 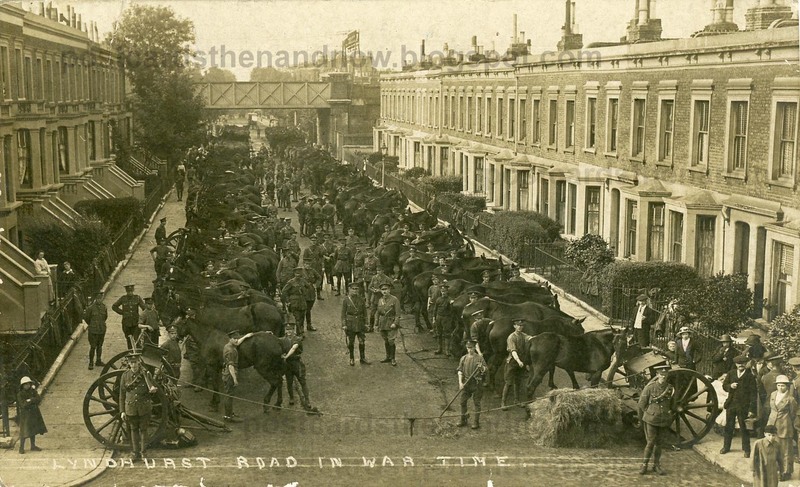 Postcard by Young & Co of Teddington. For more old photographs please visit Sepia Saturday. Click on the postcard to enlarge. Cleveleys, Lancashire, West Drive circa 1920. 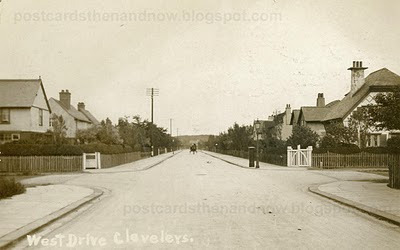 Cleveleys lies on the west coast of Lancashire, just north of Blackpool. It is pleasing to see that the picket fence of the house on the right has survived. A solitary horse and cart travels towards the camera. Postcard by uncredited publisher. Click the postcard to enlarge. 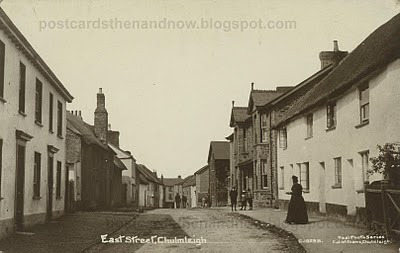 Chulmleigh, Devon, East Street circa 1912. Chulmleigh is a village in North Devon. This postcard was published by a local publisher - F. J. Williams of Chulmleigh. Click the postcard to enlarge. 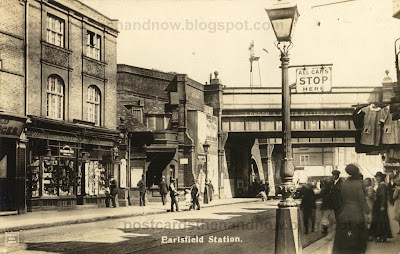 Earlsfield Station, South West London, circa 1910. Earlsfield Station appears to have changed little in the last hundred years. The modest entrance is out of sight in the top postcard, it is actually just past the bridges. The station has very recently had a make-over and a lift to the platforms has been added. Postcard by a local publisher who signed the back 'J.H.E' (I suspect J.H.E. is the shop on the left of the picture). 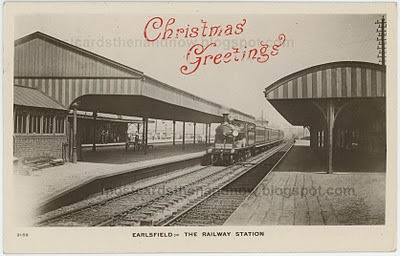 Underneath the Google Street View is a view of the station platforms with a train passing through, posted in December 1908. 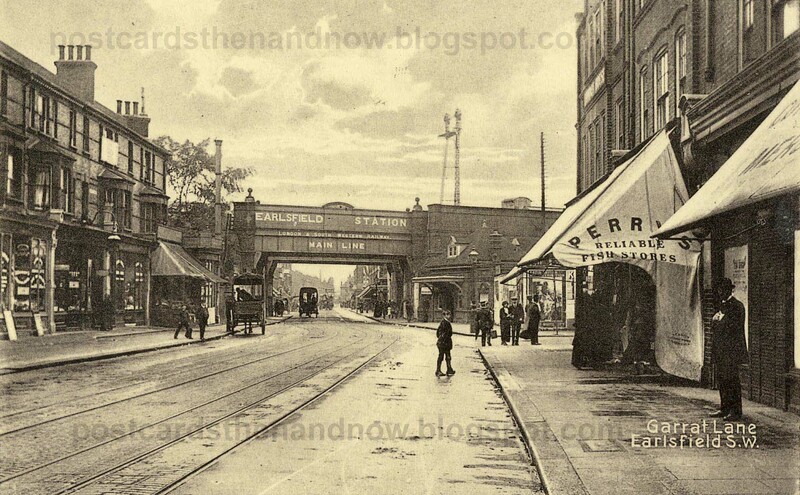 Finally, a view of the station from the other side of the bridges, showing the entrance, published by Keystone Art Co of Norwood in about 1910. 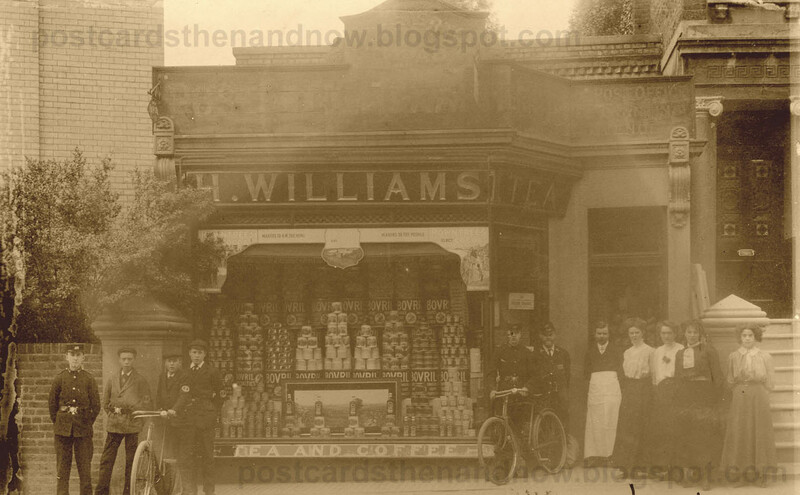 For more old photographs visit Sepia Saturday. As always, click the postcards to enlarge. 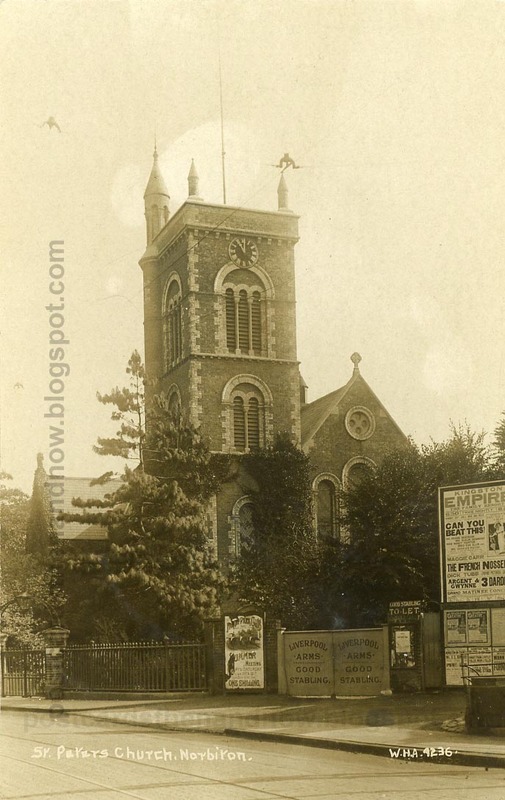 Norbiton, Surrey, St Peters Church 1914. St Peters was built in the early 1840s by Sir Giles Scott. 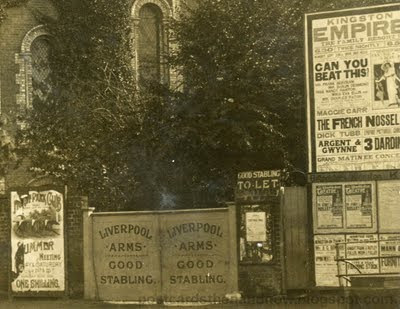 The posters by the gates of the now defunct Liverpool Arms pub are interesting. There is a detailed view of them below the Google Street View. The top one advertises a show called 'Can You Beat This?' 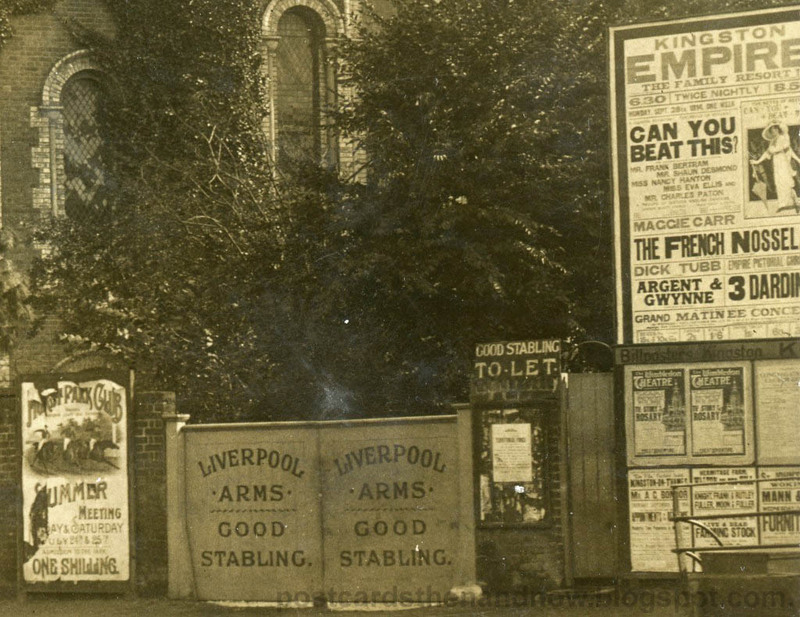 at the Kingston Empire on Monday 28th September 1914. Postcard by W. H. Applebee. Click the pictures to enlarge them. Camberwell, South London, Lyndhurst Way 1915. On the back of this extraordinary postcard is written by hand 'Some of the Camberwell Division of R. F. A. July 30th 1915'. The Royal Field Artillery were responsible for medium sized guns. Apparently there was a division based at Camberwell. 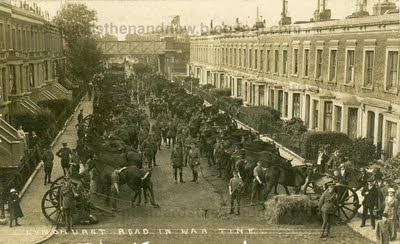 The soldiers and horses seem particularly incongruous in this quiet suburban street. The street is actually Lyndhurst Way, not Lyndhurst Road as stated on the postcard caption. The postcard was published by Frederick Alfred Finch, photographic artist, of 112 Peckham Rye. For more old pictures visit Sepia Saturday. Click the postcard to see a high-resolution scan. 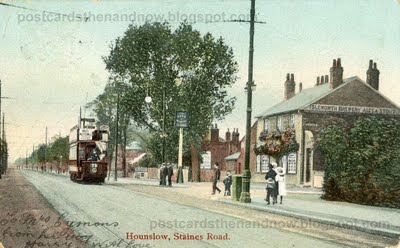 Hounslow, Middlesex, Staines Road circa 1904. This view shows the original Duke Of Wellington pub. The tram is travelling from the terminus at the end of Staines Road towards Hampton or Twickenham. Postcard published by the Collectors' Publishing Co, 42/44 Imperial Buildings, London EC. The postcard was sent in 1906 from Harry Symons to his mother at the British Consulate in Hamburg, Germany. It is possible that Harry was a soldier at the nearby barracks. Click to enlarge. Laundry Workers, Gillingham, Kent and Twickenham, Middlesex circa 1910. The first postcard shows four laundry workers and was posted from Gillingham, Kent, in 1910. I was particularly struck by the expressions on the girls' faces when I bought this postcard. The sender of the card, possibly one of the ladies in the picture, identifies herself as 'Nell'. 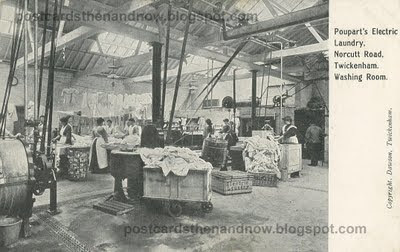 The second postcard is an advertising postcard for Poupart's Electric Laundry in Twickenham posted in 1916. Poupart's were very big in Twickenham, they also had a dairy business, a jam factory and property interests. I believe a Poupart was mayor of Twickenham at some point. Both of these postcards are very rare, the Gillingham postcard may be unique. Obviously there are no 'now' images from Google Street View for these postcards. 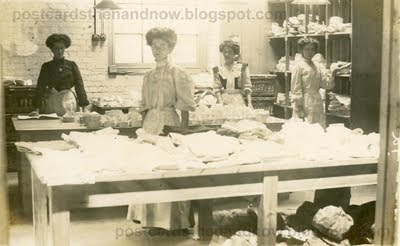 For more old images visit this week's Sepia Saturday blog. 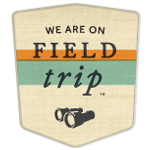 As always, click on the postcards to enlarge them.